This is the third part of an on-again, off-again series about organizational and interpretive approaches in large-scale paleontology exhibits (see the introduction and walk through time entries). This time, I’ll be discussing exhibits arranged according to phylogenetics – that is, the evolutionary relationships among living things. Natural history museums have displayed specimens according to their place on the tree of life since the days of Charles Wilson Peale, and more than any other organizational scheme, phylogeny is the way biologists think about the living world. Perhaps unsurprisingly, this arrangement was more common in the past, when exhibits were typically designed by and for experts. 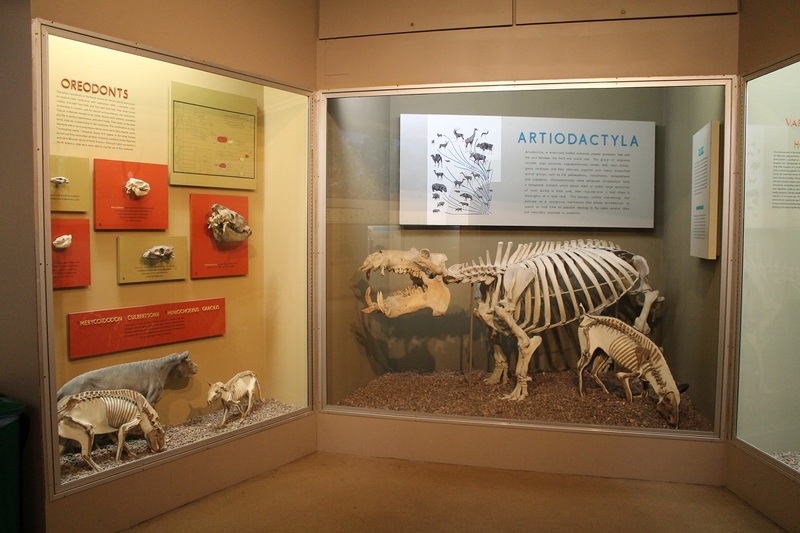 Examples of these old-school displays include the fossil mammal gallery at the Peabody Museum of Natural History and the paleontology halls at the University of Kansas Natural History Museum (neither has been thoroughly overhauled since the 1950s). The jargon-heavy signage in the Peabody Museum’s classic fossil mammal exhibit is probably ignored by most visitors. Photo by the author. Modern natural history museums rarely attempt phylogenetic exhibits. In vertebrate paleontology, an understanding of the evolutionary relationships of animals as identified via minute anatomical details is fundamental to our science. However, most people simply don’t think about the world in this way. For example, I was halfway through my first semester teaching an undergraduate anatomy course when I realized that most of the class didn’t really understand what a mammal is. The students were familiar with the word “mammal” and could provide some examples, but they couldn’t articulate what sets mammals apart from other animals, and the relationship of mammals to other vertebrates within the tree of life was all new to them. It’s easy to forget that even the most basic elements of evolutionary classification are specialized knowledge, even among biology students. Describing the history of life on Earth chronologically is relatively easy – museum visitors intuitively understand the forward progression of time. But scientific classification (as opposed to colloquial categorization) requires a lot of explanation up front, and it’s easy to overwhelm an audience with jargon. While not impossible (see Neil Shubin’s masterful Your Inner Fish), it is very difficult to explain phylogeny to a general audience in a relatable and approachable way. 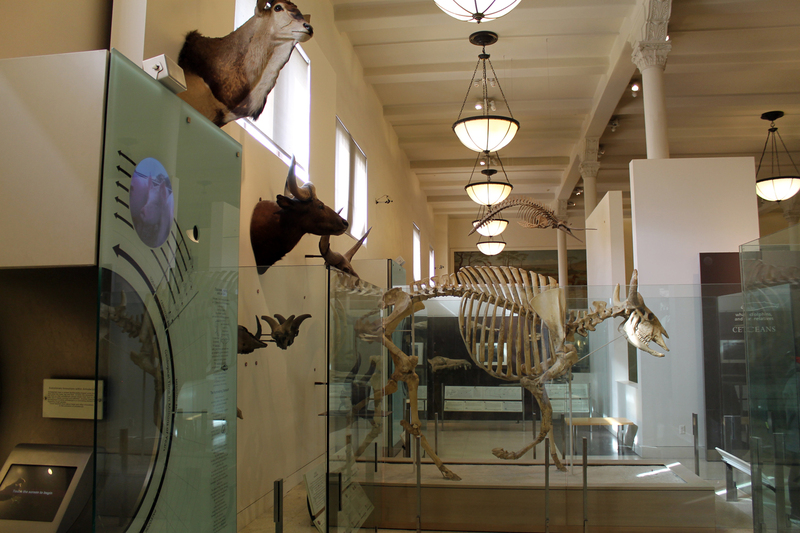 In 1995, the American Museum of Natural History attempted to do just that with the most recent renovation of its historic 4th floor fossil halls. 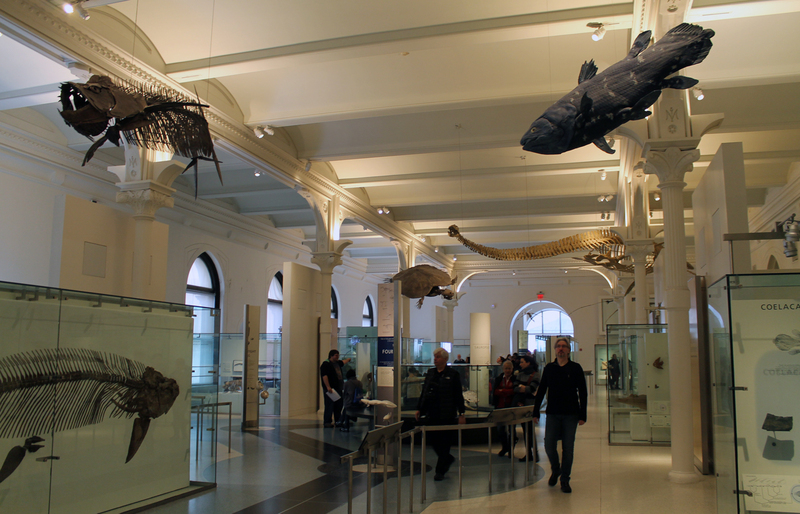 This evolutionary arrangement was a major change for AMNH, since this space had a “walk through time” layout for most of the 20th century. In the accompanying book Discovering Dinosaurs in the American Museum of Natural History, curators Norell, Gaffney, and Dingus explain that phylogenetics (and the cladistic methodology in particular) is the only way to approach the study of prehistoric life in an objective way. Patterns of evolutionary relationships revealed by cladistic analyses are hard evidence in a field of study traditionally characterized by idle speculation. Norell and colleagues argue that the new exhibit arrangement shows visitors the credibility and scientific rigor behind modern paleontology. Communicating the rigorous and trustworthy nature of scientific conclusions is a worthy goal, and the choice to ground the AMNH exhibit in this way seems almost prophetic given the litany of speculation-heavy paleontology “documentaries” that have proliferated in the years since it opened. Scientific rigor is definitely a running theme here – sign after sign explains that popularly depicted dinosaur behaviors like parental care and pack-hunting are largely untestable speculation. To a degree, this label copy takes the fun out of an undeniably fun subject, but I can appreciate the effort to legitimize paleontological science in the public eye. 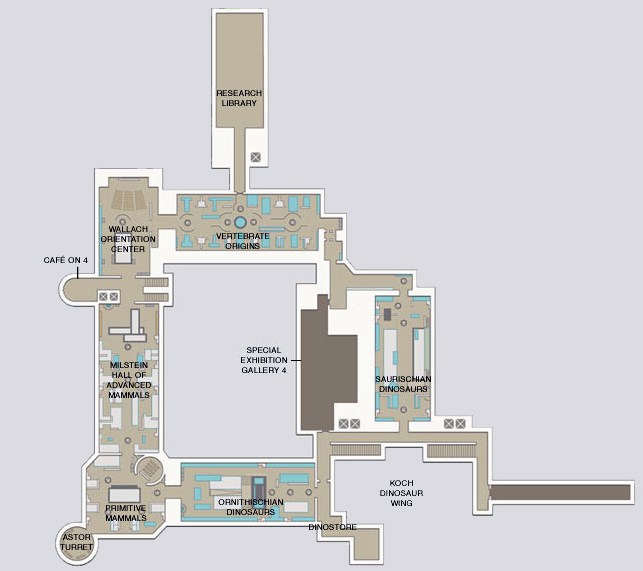 Overall, the AMNH exhibits represent an attempt to train visitors to look at fossils the way scientists do, and the phylogenetic layout is central to that goal. In the exhibit, visitors are meant to walk through a cladogram of chordates. 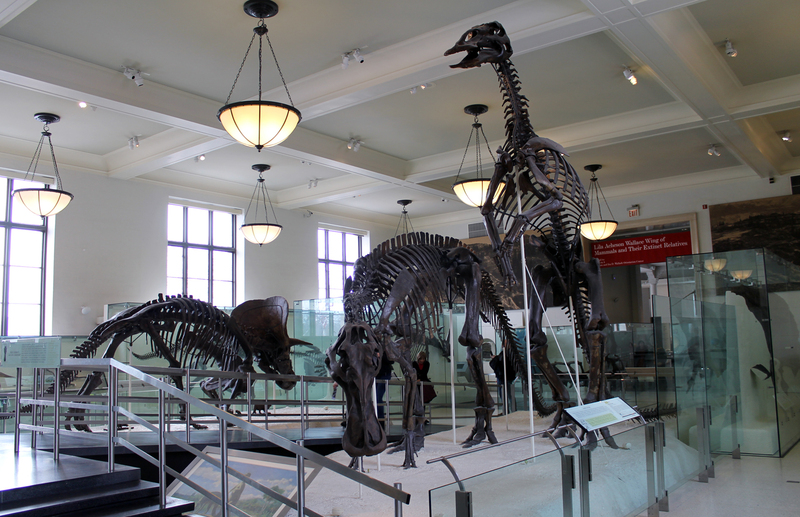 You’ll pass through large halls dedicated to broad groups like saurischian dinosaurs and advanced mammals, while visiting smaller cul-de-sacs that represent narrower clades like ornithomimids and testudines. A central black path guides you through the evolution of life, and centrally-situated pillars along your route identify major evolutionary innovations, such as jaws or the ability to reproduce on land. The insanely comprehensive vertebrate fossil collections at AMNH make this institution uniquely capable of putting so much diversity on display (although non-tetrapods are woefully underrepresented). Meanwhile, an open floor plan allows you to spend as much or as little time in each area as you wish, and ample natural lighting goes a long way toward making it possible to study specimens in detail. Pillars mark major evolutionary milestones in the Hall of Vertebrate Origins. Photo by the author. The evolutionary pathway becomes considerably less obvious among the dinosaurs. Photo by the author. Nevertheless, I agree with Brian Switek that the AMNH fossil halls don’t do the best job communicating the story of vertebrate evolution to their core audience. The underlying purpose of any exhibit structure is to provide meaning and context for objects – to help visitors see them as more than neat things to look at. 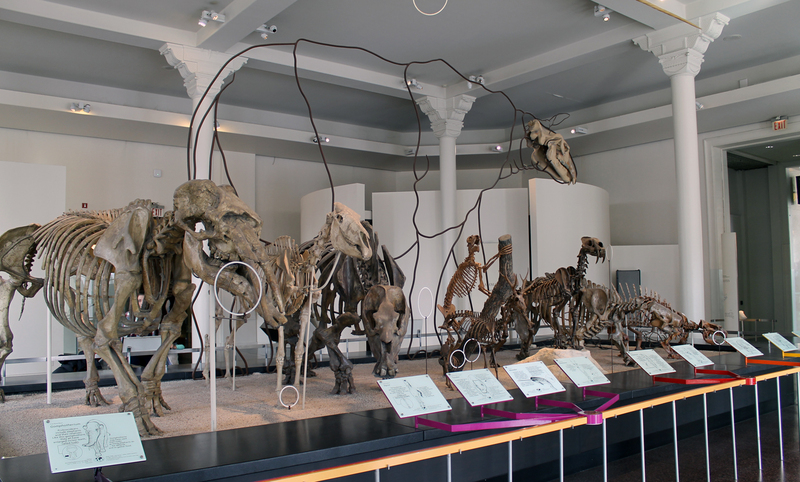 According to visitor surveys, the default mode of understanding for most people passing through a paleontology exhibit is what I’ve been calling “dinosaur pageantry.” After seeing the exhibit, most visitors will recall a list of cool skeletons they saw. A few might consider which ones are meat-eaters and which ones are plant-eaters, but without further prompting that’s all we can usually expect from non-specialists. It’s the museum’s job to give visitors the intellectual tools to contextualize those fossils in a more sophisticated way, but there’s a fine line to walk. Provide too little information and nobody learns anything, but provide too much and the content is ignored. Unfortunately, the AMNH exhibits fall into the “overkill” category. As discussed, phylogeny is complicated, often counter-intuitive, and largely unfamiliar to many visitors. To overcome this, the AMNH designers rely on a fairly long orientation film, which introduces the concept of categorizing organisms based on shared derived characteristics. There are a few problems with this. First there’s the film itself, which dives right into the traits that characterize different groups – like the stirrup-shaped stapes of derived mammals and the temporal fenestrae of archosaurs – without explaining why these traits are significant. To a layperson, these probably seem like really inconsequential things to hang a whole group on. The video also presents a cladogram of vertebrates without explaining how to read it. As Torrens and Barahona demonstrate, interpreting a phylogenetic tree is a specialized skill that many natural history museum visitors lack. Second, I saw no incentive or instruction to actually start my visit to the 4th floor in the orientation hall. There are no less than four entrances to the fossil exhibits, so many visitors won’t know there is an orientation film (I sure didn’t) until they’re halfway through the galleries. Finally, there’s the reliance on media in general: do we really want visitors to spend even a portion of their time in an exhibit full of real fossils watching a video in a darkened room? Telling visitors what to think in a narrated video is easy, but it’s not nearly as meaningful as showing them the same concept with specimens (or better yet, coaxing them to reach conclusions themselves). Iconic mounts in the Hall of Saurischian Dinosaurs are iconic. Photo by the author. Within the actual fossil halls, interpretation remains stubbornly unapproachable. For example, the sign introducing proboscidians tells visitors that this group is defined primarily by eye sockets located near the snout. An observant visitor might wonder why scientists rely on such an obscure detail, as opposed to the obvious trunks and tusks. There’s a good teaching moment there concerning why some characteristics might face more selection pressure (and thus change more radically) than others, but instead visitors are only offered esoteric statements. Relatedly, the exhibit does little to prioritize information. Most label text is quite small, and there’s a lot of it. Compare this to Evolving Planet at the Field Museum, where there is a clear hierarchy of headings and sub-headings. Visitors can read the main point of a display without even stopping, and parents can quickly find relevant information to answer their charges’ questions (rather than making something up). Evolving Planet also compares favorably to the AMNH fossil halls in its informative aesthetics and spatial logic. At FMNH, walls and signs in each section are distinctly color-coded, making transitions obvious and intuitive. 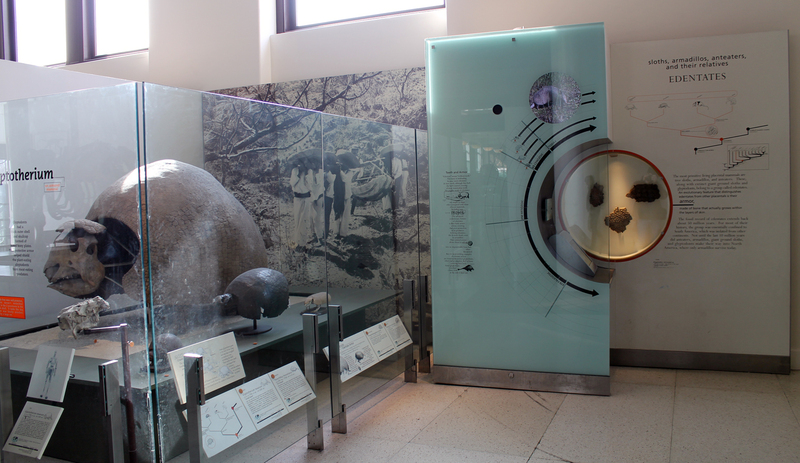 Likewise, consistent iconography – such as the mass extinction zones – helps visitors match recurring themes and topics throughout the exhibit. AMNH, in contrast, has a uniform glass and white-walled Apple Store aesthetic. It’s visually appealing, but doesn’t do much to help visitors navigate the space in a meaningful way. Phylogenetic interpretations change quickly – Edentata is no longer considered a natural group. Photo by the author. The phylogenetic layout introduces a number of other unique interpretive challenges. Since there is no temporal axis, it’s often unclear whether the lineage in a particular cul-de-sac cluster went extinct, continued on, or gave rise to another group elsewhere in the exhibit. Visitors that want to know which animals lived contemporaneously are out of luck. Meanwhile, the exhibit sometimes uses modern animal skeletons to fill out displays where fossil examples are limited, such as bats and primates. While these are labeled, the text is too small to be seen from a distance. The evolutionary organization is also burdened by the fact that phylogenetics is a fast-moving and often changing field of study. While the order of geologic time periods will never change, the 20 year-old displays at AMNH are already out of date in several details. For example, there is a cul-de-sac devoted to edentates, which is now considered polyphyletic, and a cladogram in the Hall of Saurischian Dinosaurs incorrectly places tyrannosaurids among the carnosaurs. Glass architecture lets visitors see through displays and get a sense of what lies beyond. Photo by the author. This display is a great example of the diversity in mammal teeth, but it’s a confusing centerpiece for the Hall of Primitive Mammals. Photo by the author. 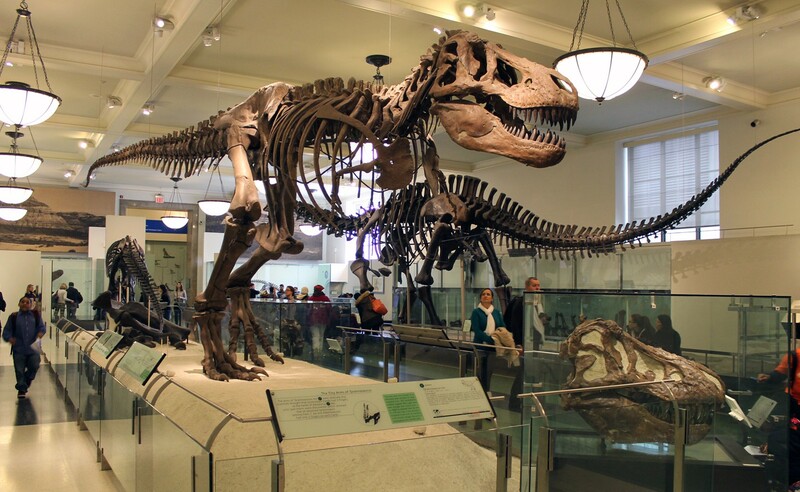 The AMNH fossil exhibits excel in many respects, chiefly in the amazing diversity and quantity of specimens on display. The exhibit throws a lot of good science at visitors, but falters in explaining why it matters. The point of all this is not to nit-pick the design choices at AMNH, but to reiterate that phylogenetically-arranged fossil exhibits are really hard to pull off. This is not the most intuitive way to introduce the history of life, or even the process of evolution. With so much background to cover, perhaps a more structured and linear layout would be better. In fact, a lot of my issues with the AMNH fossil exhibits seem to stem from a disconnect between the phylogenetic interpretive content and the wide-open aesthetics. Open exhibits can be great, but in this case it hinders the learning opportunities for self-guided groups of visitors. It’s difficult to imagine a typical visitor, arriving with their family or another mixed-age group, having the patience to make sense of it all. Regrettably, such visitors default to the dinosaur pageantry level of understanding, making all the work invested in creating a meaningful exhibit space for naught. Torrens, E. and Barahona, A. (2012). Why are Some Evolutionary Trees in Natural History Museums Prone to Being Misinterpreted? Evolution: Education and Outreach 1-25. You should come check out the exhibit I helped create at the Stamford Museum sometime. It runs until May 25! Awesome post as always. Cool 😀 I’d love to have you!!!! The very fundamental difficulty with basing an exhibit on phylogeny is that phylogenies are tree-shaped and exhibition spaces are not. If you use the linear organisation of life-through-time, you can thread an ordered sequence of exhibits through whatever space you have; but you can’t superimpose a tree on most spaces. So I think the AMNH experiment is a bold one, but ultimately flawed for very fundamental reasons. Good point – it’s hard to superimpose a tree on the cyclical exhibit space at AMNH. I imagine the huge size disparity in specimens (e.g. sauropods versus fish) would also be a big obstacle in putting together a walkable phylogeny. Agreed. Another problem with a phylogeny based layout is that it is hard to navigate. The average museum goer most likely knows little or nothing about phylogeny and would much rather learn about the animals themselves then how they are related. The reason the AMNH exhibit works is the fact that they have an interactive movie where visitors can learn about phylogeny and taxonomy in general. If you are going to attempt to educate the public about phylogeny, make a label copy or an interactive display rather then using the layout as an example, because it confuses people. … but on re-reading my comment I see that it looks rather negative about the AMNH exhibit, so I want to counterbalance that by saying that in every other way but the not-quite-achievable goal of a phylogenetic layout, I think it’s absolutely superb, making wonderful use of natural light (are you listening, Natural History Musuem!) and having a proper respect for both up-to-date ideas and its own history. Please, please come to AMNH again soon and learn first-hand what the Volunteer Tour Guides, Fossil Explainers and Education Volunteers add to the visitor experience. Phylogeny (and much more) CAN be communicated effectively and in a very, very few minutes, to visitors with no previous knowledge of the concept. That is what I and my fellow Volunteers work to do every day we are on the 4th Floor. Ben, your posts have been fascinating and highly informative. Thank you. I will make use of them to improve my own tours and will pass them on to my colleagues. It has been several years since I made it to Chicago and The Field but a return visit is clearly essential. Mike, I am a faithful reader of SVPOW! Ah. Jerrold, I would love to return to the AMNH — every week if I could! If only it weren’t for that darned Atlantic Ocean in the way. Great to know that SV-POW! is reaching people in your very important position. It’s all part of the crucial democratisation of science. Thanks for weighing in, Jerrold! Sadly, I’m also not sure when I’ll be back to AMNH. If you have the time, however, I’d be very interested in learning more about your teaching strategies in the 4th floor exhibits. Feel free to drop me a line, perhaps we could put together a counterpoint to my post above? I would be happy to put together a short summary of my approach to talking to visitors in the 4th floor halls. However, it might be a little long for a post. Should I send it to you directly? Just tell me your preference. Thanks. Sounds to me like a Guest-Post in the making! That’d be excellent, Jerrold! You can send it to extinctmonsters at gmail dot com and I’ll make it a guest post.